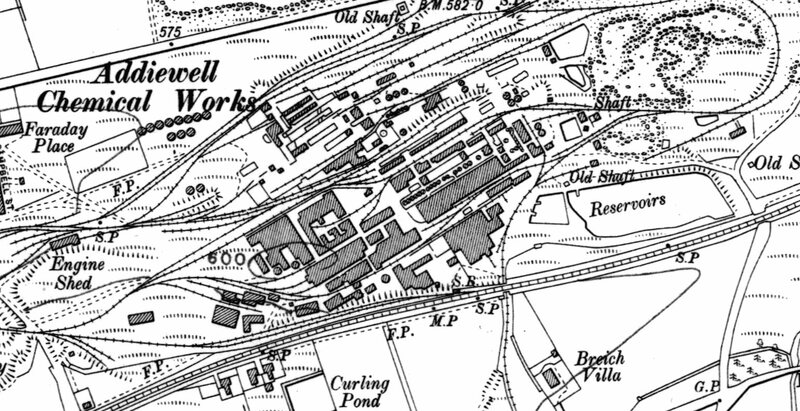 On 16 May 1865, the Scotsman newspaper published a detailed account of the Addiewell Oil Works. It's particularly interesting as the works was just in the process of being built. The article goes on to describe the brickworks, the shale and coal pits, and a detailed description of the processing of shale in the oil works. The article concludes with promoting the idea that the ships of the Royal Navy should run on oil, not coal - a proposal that came to pass in the early years of the 20th century. For some 20 years, the Royal Navy sailed the oceans fuelled by West Lothian shale oil. This page was added by Sybil Cavanagh on 30/06/2012.